Full and free pedestrian use of a street, highway, sidewalk or other access to the same extent that any other person has a right to. There are restrictions regarding the entry of service animals into Alaska. Customers planning to travel to Alaska should contact Alaska State Attorney General. Your pet must have an ISO pet microchip inserted and then be vaccinated for rabies and various other diseases at least 21 days but not more than 12 months prior to travel prior to travel. If your pet' microchip is not ISO 11784/11785 compliant, you can bring your own microchip scanner. Pets entering Estonia from a country with a high incidence of rabies must have Blood Titter Test 90 days in advance to avoid quarantine. Unvaccinated pets (dogs and cats only) under 3 months old may enter an EU Country, but there are additional regulations that must be met. Certain aggressive breeds of dogs are prohibited from entry. The regulations regarding bring guide dogs into Belgium are quite complex. In most cases owners will be asked to provide documents on identification and the general health of the animals. Guide dog owners are required, like everywhere in Europe, to produce upon request a valid pet passport which officially records information related to all vaccinations the dog has had. In Germany vaccination against rabies and identification by microchip implant are mandatory. All pets must arrive in UAE manifested cargo- it cannot arrive as accompanied baggage. There is no quarantine in the UAE for pets arriving with all their vaccinations, documents or any other ministry requirements in order. If everything is not fully in order, then your pet may be quarantined, re-exported or even confiscated. There are restrictions regarding the entry of service animals into Hawaii. Customers planning to travel to Hawaii should contact the Hawaii Animal Quarantine Branch manager directly for quarantine requirements. The 24-hour phone number is 1-808-837-8092. You may also view animal quarantine information at the Hawaii Department of Agriculture website. 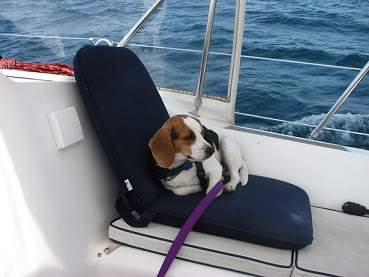 If you have an assistance dog you will not be able to disembark until last. Stay behind the yellow line on the platform until all disembarking passengers have left the cruise ship.